JFM Is Getting a Face Lift! Construction began last week and is expected to be finished in late June. Some of the upgrades include new sidewalks along the sides of each building, and new steel construction awnings to cover those sidewalks. 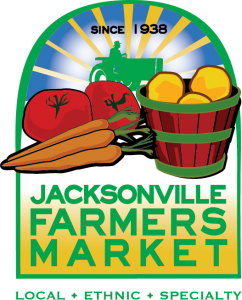 The new awnings will allow for shopping in any weather at the Farmers Market, and they will also provide shade for our vendors. running during all phases of construction. 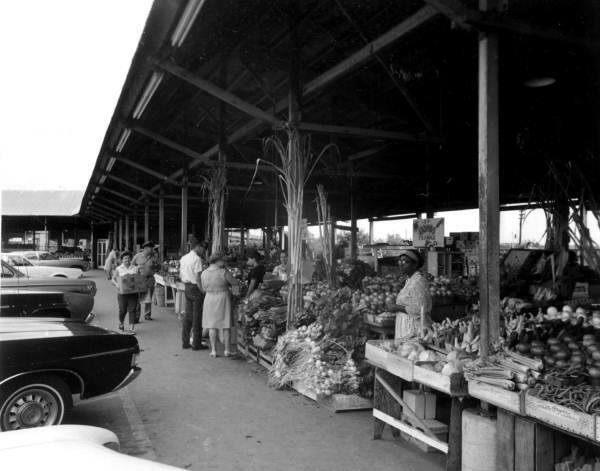 Also, to help keep your shopping experience quick and easy, there won’t be any changes to the flow of traffic in or around the market. 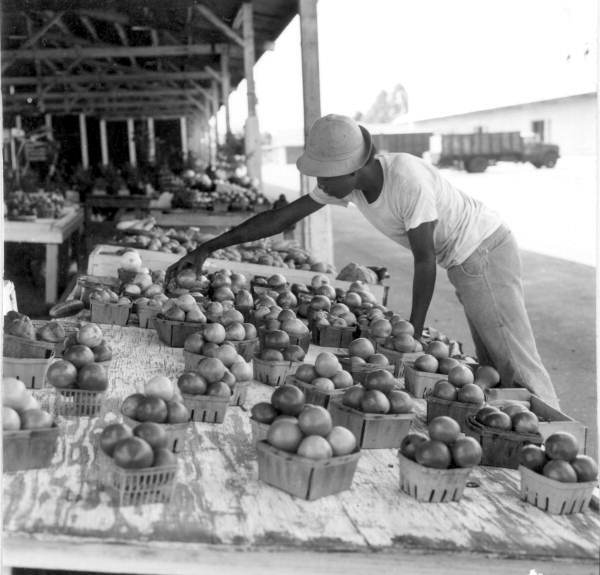 For an update on produce; watermelons are in season now, and we have plenty of them. We’re at the end of the winter’s crop which means no more citrus or strawberries. Some more popular items that will be back at the market soon are blueberries, peaches and a variety of peas. 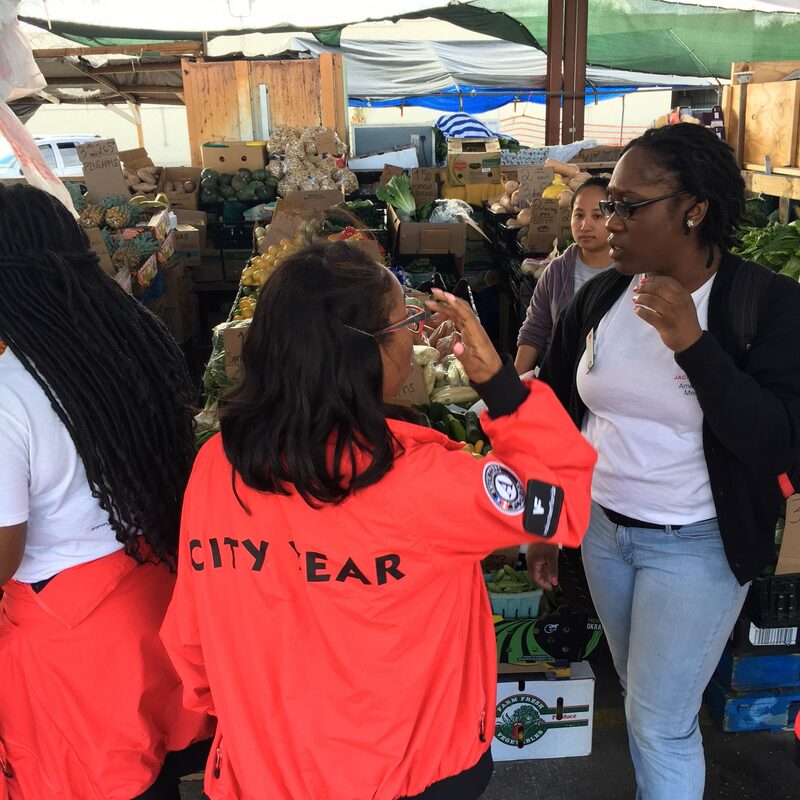 Yesterday we had the pleasure of hosting the City Year Jacksonville AmeriCorps members for a tour of the Jacksonville Farmers Market. 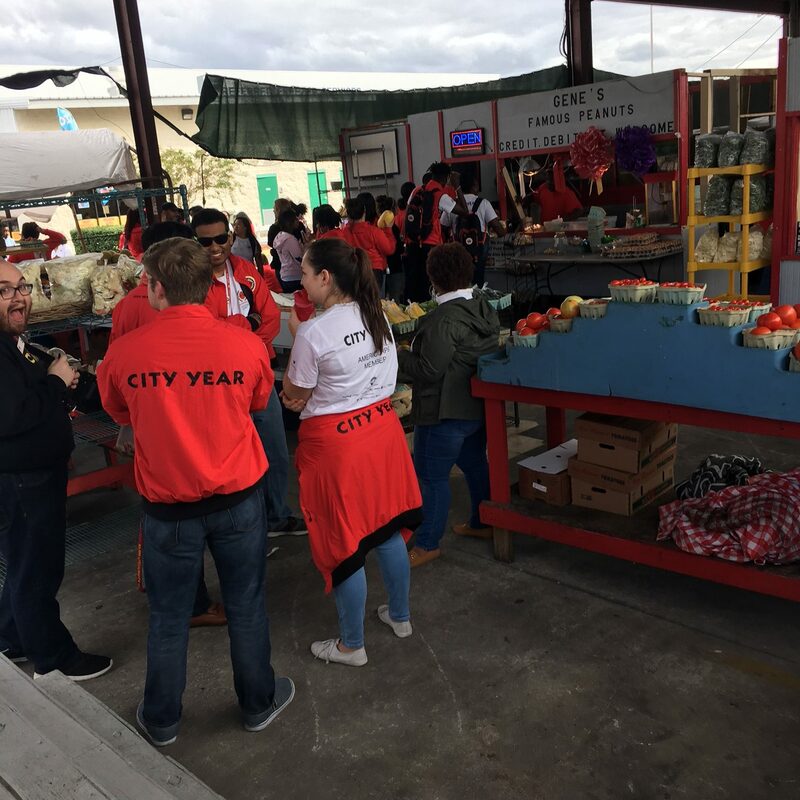 They were impressed with our huge variety of fresh fruits, vegetables, seafood and more. 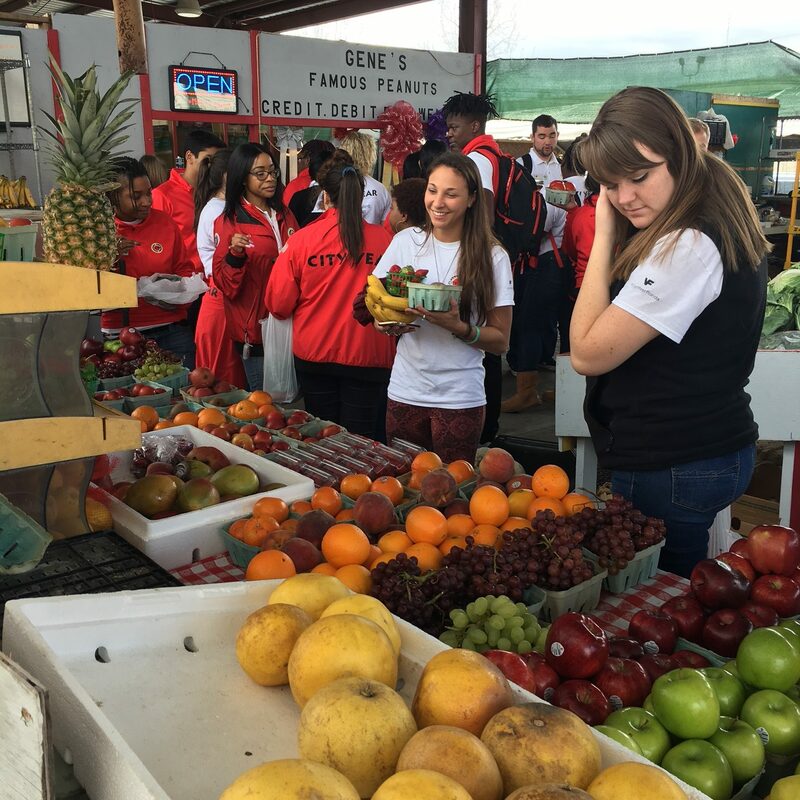 They even did some shopping to take advantage of our low prices. 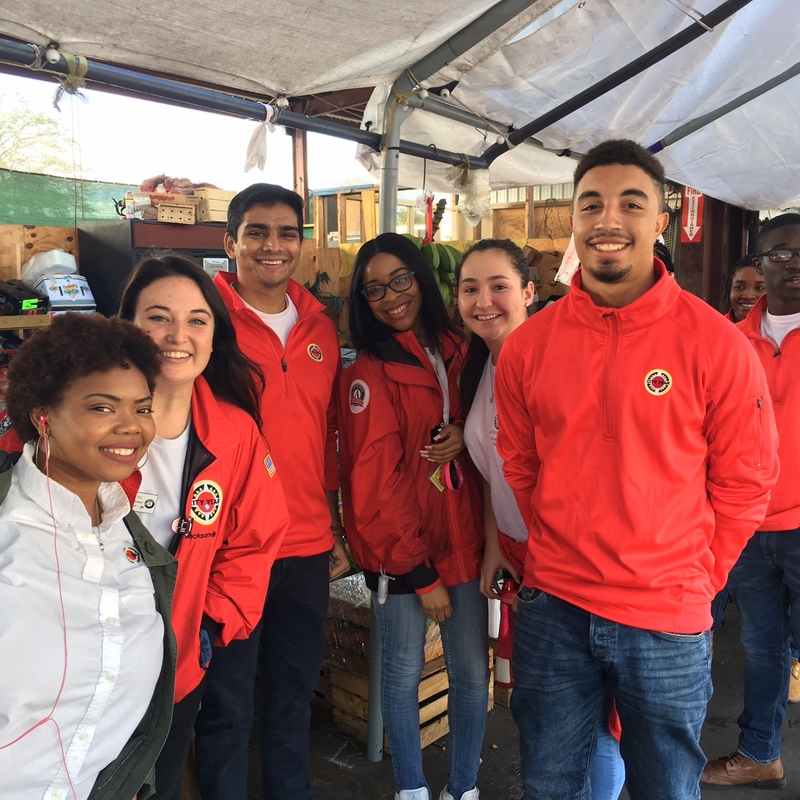 If you aren’t familiar with City Year, it’s a nationwide organization working to bridge the gap in high-poverty communities between the support that students need, and what their schools are designed and resourced to provide. 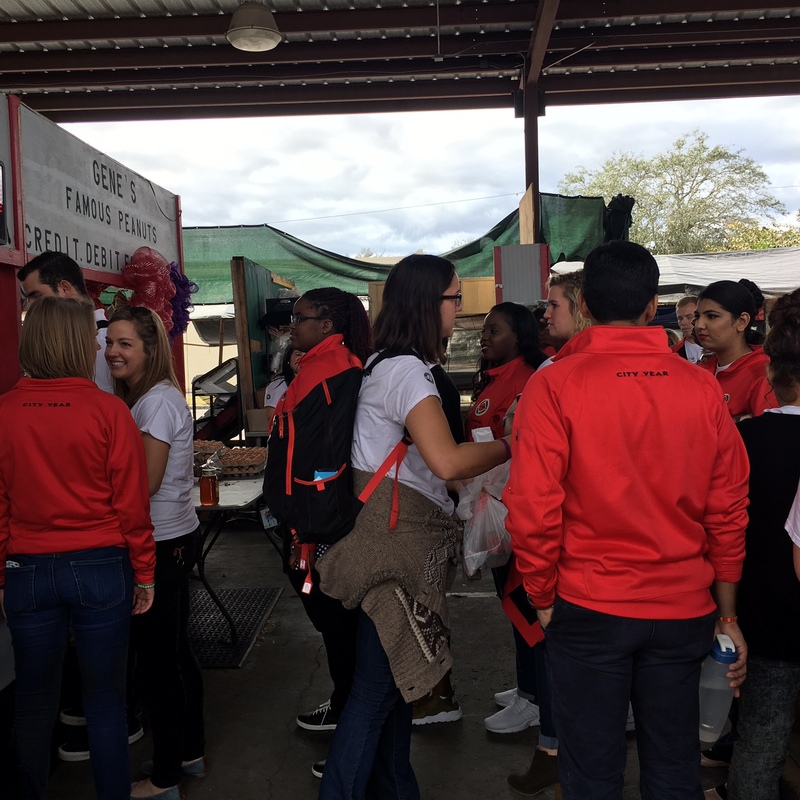 Their work is helping to increase graduation rates across the country, and change the lives of the students they serve. Rest roasted asparagus and tomatoes on a bed of watercress for a special touch. The fat-free dressing is a sweet-sour combination of fresh citrus juices, honey and Dijon mustard. Just as tasty warm or at room temperature, this salad works well when served as part of an easy buffet-style brunch. Place asparagus in a large bowl. Add tomatoes and oil and toss to coat. Spread in a heavy roasting pan or rimmed baking sheet, spooning the tomatoes between and on top of the asparagus. Sprinkle with 1/2 teaspoon salt and add a generous grinding of pepper. Roast until the asparagus is crisp-tender and the tomatoes are warmed and slightly crinkled, about 15 minutes. Set aside until ready to serve. Whisk lemon juice, orange juice, honey, mustard and remaining 1/4 teaspoon salt in a medium bowl until blended. Reserve half of the dressing in a small bowl. Add watercress to the medium bowl; toss to coat. Spread the watercress on a platter. 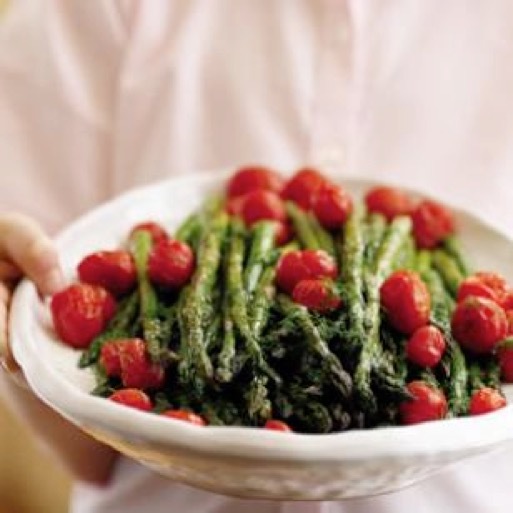 Arrange the roasted asparagus on the watercress and top with tomatoes. Drizzle the reserved dressing over the asparagus and tomatoes; sprinkle with dill. Serve warm or at room temperature. Bright green asparagus is a delicious reminder that spring has arrived! Did you know the best months to buy this vegetable are March, April and May. 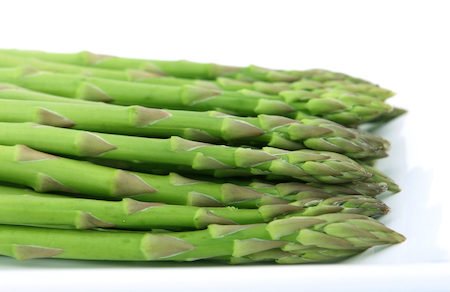 Not only does asparagus make a tasty side dish, it has a multitude of health benefits. It’s a great source of fiber, folate and vitamins A, C, E and K. It’s also a good source of chromium, a trace mineral that helps prevent diabetes. This vegetable is an excellent source of glutathione, which is a compound that helps your body detoxify and break down carcinogens and other cancer-causing free radicals. This is due to the folate that is found in asparagus. Folate works with vitamin B12 to help prevent cognitive decline. Vitamin B12 is found in fish, poultry, meat and dairy. This means having a side of asparagus with your favorite seafood is excellent brain food! In a study from Tufts University, older adults with healthy levels of folate and vitamin B12 performed better on a test of response speed and mental flexibility. Its high levels of Asparagine, an amino acid that serves as a natural diuretic, cause this. Why is this important? Increased urination releases fluid and excess salts from your body, which alleviates bloating and discomfort. This is good news for people who have high blood pressure and other heart-related diseases. The best ways to cook asparagus to preserve its nutritional content and antioxidant power are roasting, grilling and stir-frying. These are good methods because they take a short amount of time and don’t use any water. Generally, the longer you cook a vegetable, the more of its nutrients are lost during cooking. Also, when you use water to cook vegetables, such as boiling, a lot of the nutrients seep out into the water, and are lost. 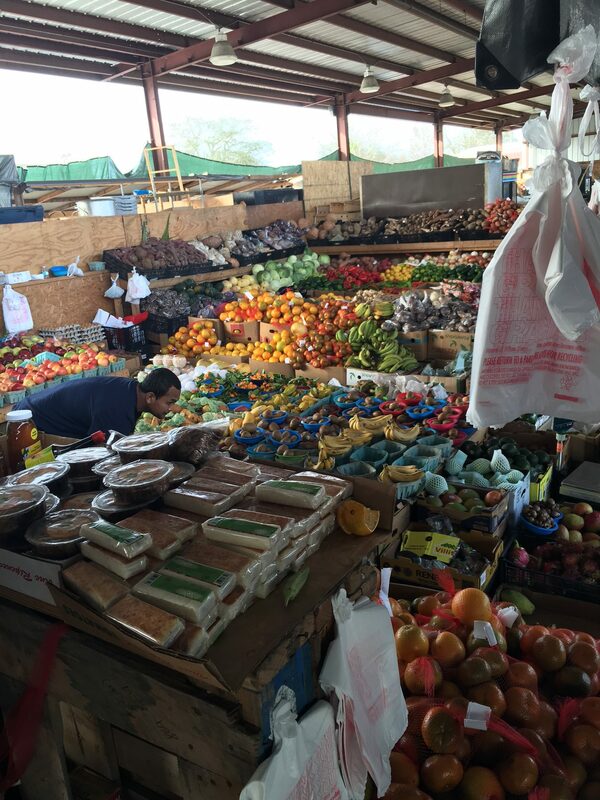 You can find ethnic specialties a the JFM. 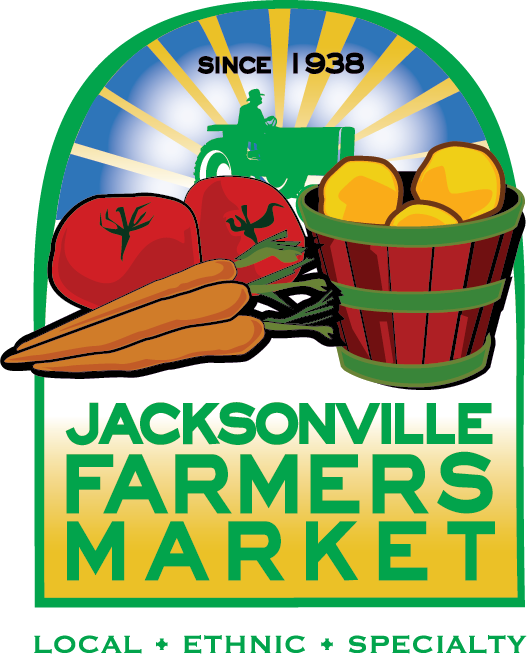 The JFM operates 363 days a year.